Product code: ES6074 Categories: Sold Items, Sold Rings. 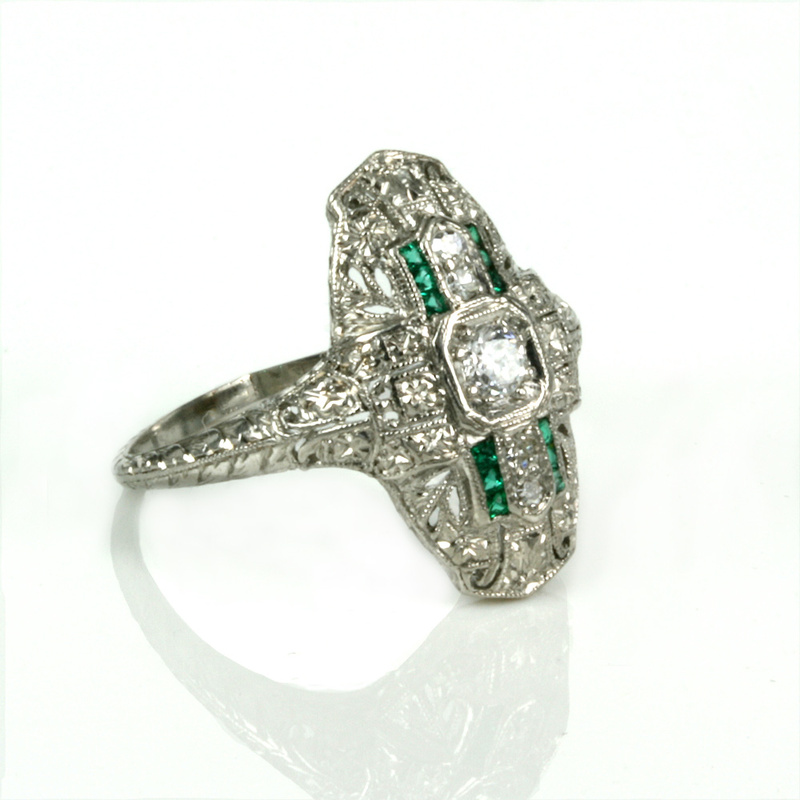 Here is a marvelous emerald and diamond ring dating from the fabulous Art Deco era of the 1920’s. With so much attention to detail, the ring is set with a diamond in the centre that measures 0.24 carats. 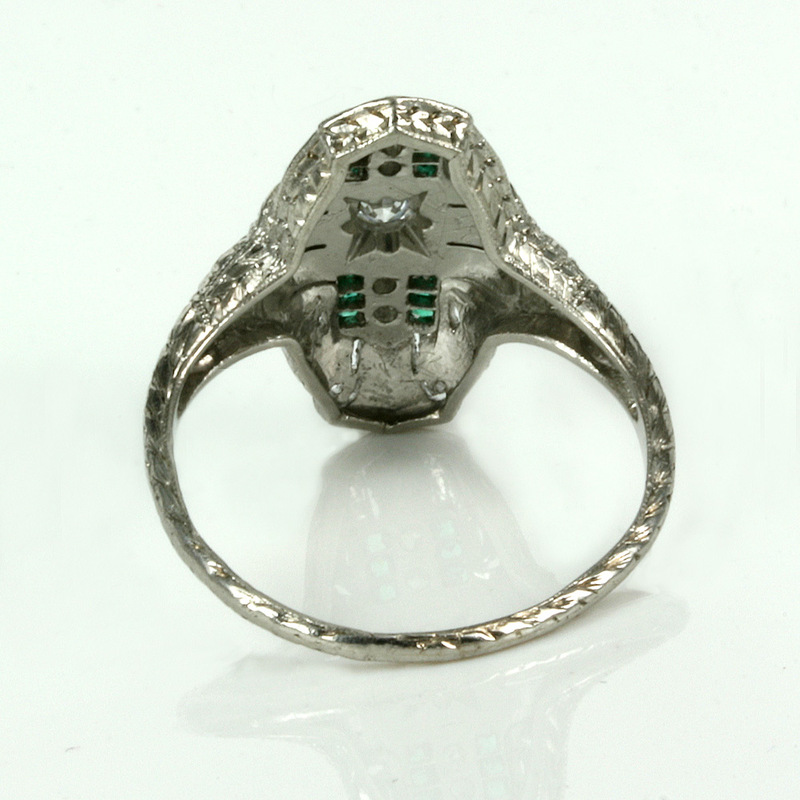 Typical of Art Deco jewellery which often has a shape inside a shape, the round diamond is set into a octagonal setting adding to the wonderful geometric designs characteristic of this era. With a further 4 diamonds that total 0.08 carats, there are of course those parallel likes set with emeralds that really makes this ring stand out. There are 12 emeralds that total 0.12 carats and stand out so well against the pure white colour from the platinum and the sparkle from the diamonds. In a very elegant lozenge shape, the ring measures 20.6mm by 11.3mm across and is wonderfully sculptured to follow the curve of the finger. With so much detail from the pierce work design to the engraved sides, this is a truly spectacular Art Deco ring that is destined to impress and make the woman who wears this feel very special indeed.